Dual energy X-ray absorptiometry (DXA) using a single-beam (SB) design is a well-established procedure for measuring bone mineral area density (BMD). Recently, fan beam (FB) techniques have become available to measure BMD. We evaluated the QDR1000 and QDR2000 densitometers with regard to precision and cross-compared values using single beam (SB) and FB techniques. 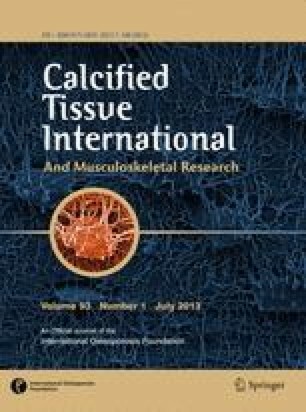 To study the effect of osteoarthritic changes on bone measurement (BMC in g) and bone mineral area density (BMD in g/cm2), both parameters were measured in patients with and without osteophytic calcifications (OC) of the lumbar spine. Precision errors for BMD in vitro over 1 and 6 months using the QDR2000 were 0.4% and 0.6% for SB and 0.5% and 0.7% for the three FB modes. For QDR1000 only SB is available. Using this scan mode, the BMD difference (δ=0.1%) in vitro between QDR1000 and QDR2000 was not significant. The short-term (same day) reproducibility of BMD in vivo was 0.85% for SB mode and 1.1% for FB scan mode (n=33). The midterm (1 month) precision errors were 0.9% for SB and 1.5% for FB (n=11). The spine BMD of 751 patients from our outpatient clinic and department of rheumatology was 1.7% lower with FB than with SB (0.878±0.137 versus 0.888±0.146 g/cm2). Lower (1.8%) BMD values were also found in the hip with FB compared to SB (0.805±0.111 versus 0.821±0.111 g/cm2). There was a highly significant (P<0.00001) correlation between SB and FB on the spine (r =0.99) and hip (r=0.98) using the QDR2000. Correlations found QDR1000 and QDR2000 were lower on the spine (r=0.97) hip (r=0.93). In contrast to hip BMD, spine BMD was significantly higher in women (n=78) with OC (FB: 0.894±0.134 g/cm2, SB: 0.900±0.140 g/cm2) than in normals (n=148) (FB: 0.844±0.130 g/cm2, SB: 0.865±0.140 mals (n=148) (FB: 0.844±0.130 g/cm2, SB: 0.865±0.140 g/cm2) (P<0.05). The FB mode provides reproducible data in vitro and in vivo, though not as precise as SB. FB results in vivo are 1–2% lower than FB results, even with identical results in vitro. Women with OC present with higher BMD values in spine scans than normals.